Let’s visit the Hall of Armors and check out all the suits now! 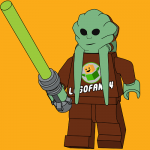 The first minifigure we’ll look at is this exclusive one which was released in 2012. 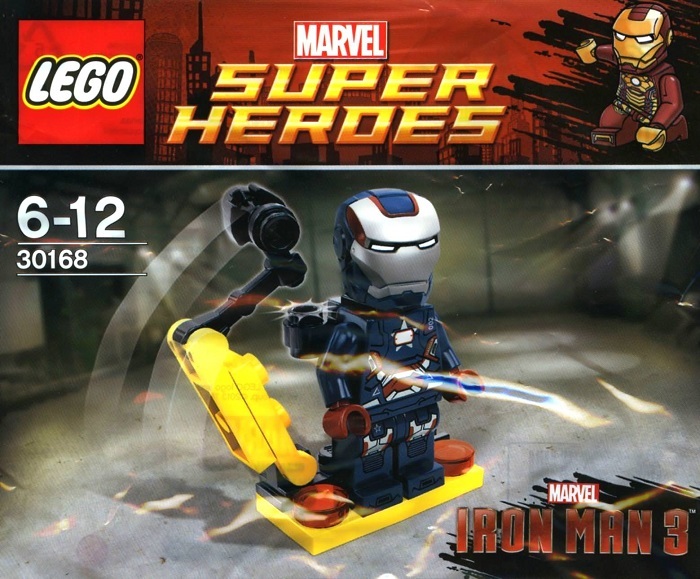 It was given out to people in San Diego Comic Con 2012, alongside an exclusive Captain America minifigure. Unlike all the other LEGO Iron Man minifigures, this one has a printed mask and is a lot less detailed, with a simpler torso print and no leg printing. Nevertheless, the printed helmet makes it pretty unique and it is a cool collectible for those who managed to get their hands on it. Next up is the Iron Man MK6 suit, which appeared in Marvel’s The Avengers (2012). This minifigure came in set 6867 Loki’s Cosmic Cube Escape, as well as a polybag. The figure debuted a new molded helmet for Iron Man with a visor that could flip open, and the piece is still in use today. The torso has a printed triangular arc reactor on it which is accurate to the Mark 6 in the movies, and there is a fairly even level of detail throughout the figure. 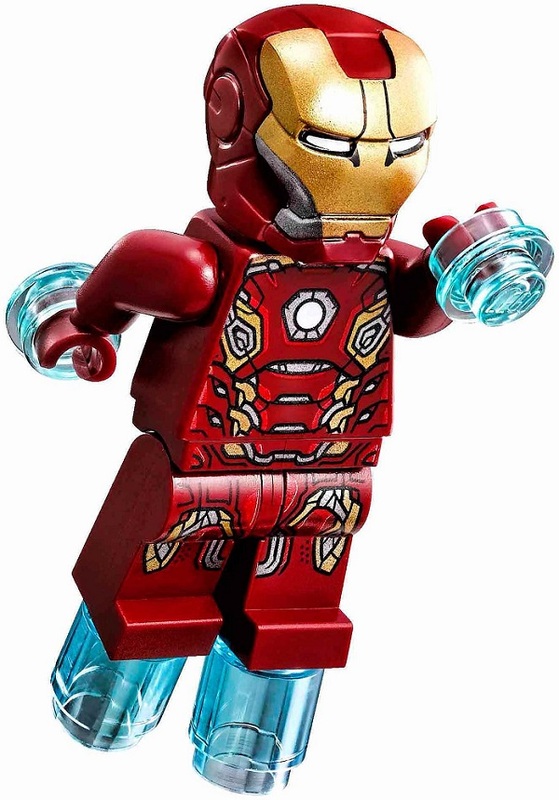 Translucent light blue pieces are used on the hands and feet to represent repulsor blasts – this technique was used for Iron Man minifigures until very recently. 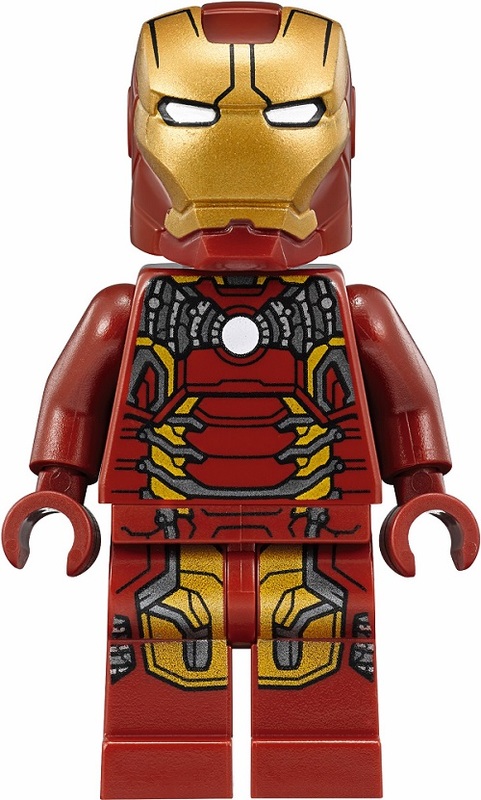 Next up is the other LEGO Iron Man suit released in 2012 – the Mark 7. This suit was also used in the first Avengers film, deployed after Loki threw Tony Stark off Stark Tower, and also used in the final battle against the Chitauri. It had the same helmet mold as the MK6 but had a circular arc reactor printed on the torso. The figure appeared in 6869 Quinjet Aerial Battle, but was later re-released in a LEGO Juniors set that pitted him against Loki. LEGO skipped quite a few Iron Man suits when they created sets for the Iron Man III movie, which is perfectly understandable as the number of suits in that movie was pretty insane. 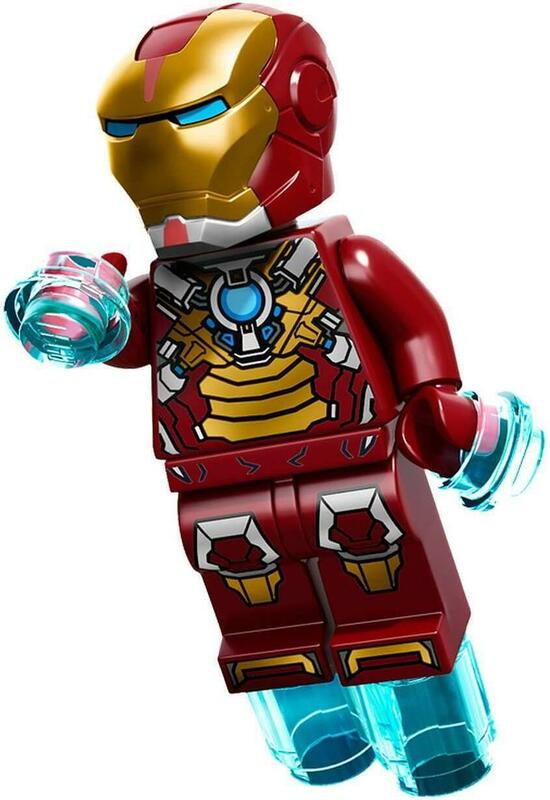 This suit is the MK17 “Heartbreaker” suit, appearing in the smallest of the three Iron Man III sets, 76008. It had the same helmet mold but the visor had some extra printing on it that gave it blue “eyes” and a silver chin. The torso was also very detailed, with some silver elements added and a round blue arc reactor. The leg also had great printing that continued onto the toe areas, while translucent light blue elements were once again used for repulsor blasts from the hands and feet. Up next is arguably one of the most detailed official LEGO minifigures yet, the MK33 Silver Centurion suit. This came in a polybag as a videogame preorder exclusive for the LEGO Marvel’s Avengers videogame. It has insane printing all over it and came with an awesome bruised Tony Stark face print that could easily be used for Tony in Captain America: Civil War. 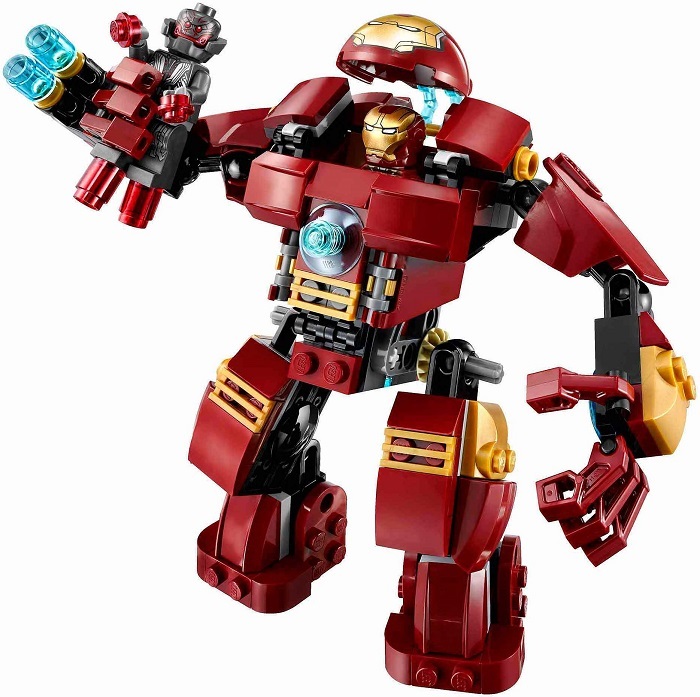 This is easily my favorite LEGO Iron Man suit and I hope to be able to get it someday. This suit is the Iron Man MK37, nicknamed the “Hammerhead”. It was created as an underwater scuba diving suit, and appeared in Iron Man III. The minifigure itself came in an Avengers Assemble (the animated show) set. 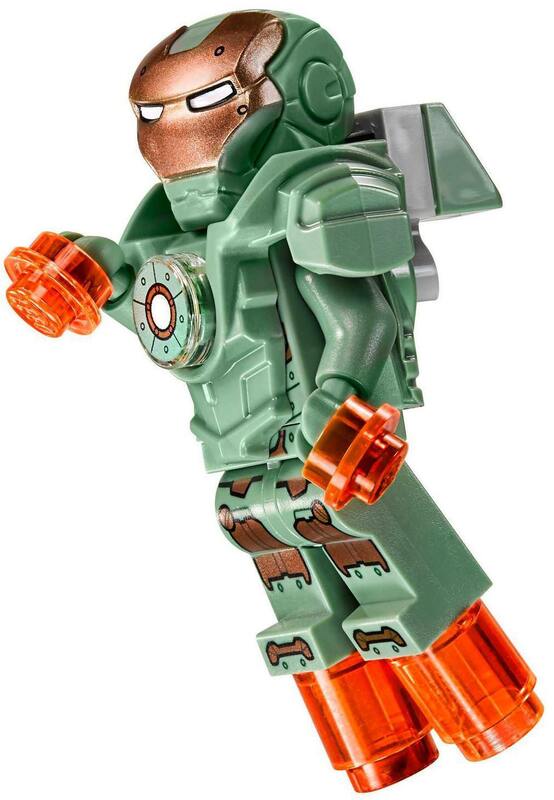 It has a very unique sand green color scheme with a bronze face plate and orange repulsor blasts. 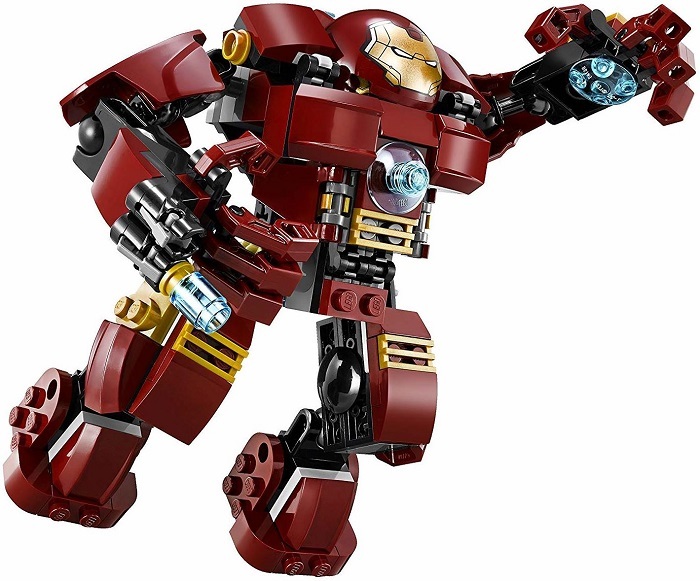 What separates it from most of the other LEGO Iron Man suits is the bulky armor piece used for the torso to make it more imposing and add some bulk. It also has an arc reactor printed on a 1×1 round tile, and a cheese slope used on the back to create a shark fin-like profile. Up next is Tony Stark’s Space Iron Man suit, nicknamed Gemini. It has a very unique white and gold color scheme which reflects real-life space suits. Like the Hammerhead, this armor did appear in Iron Man III as part of the many Iron Man suits that Tony Stark deployed in the final battle against Aldrich Killian. This minifigure came in 76049 Avenjet Space Mission, with some pretty cool torso and leg prints. It had translucent blue repulsors on its hands and feet but it also had a neck bracket attachment that gave it additional repulsor boosts on the back (like a jetpack). This suit is the Mark 42 Iron Man Armor, which does not have a nickname. However, it played a very significant role in the Iron Man III film, serving as Tony Stark’s primary suit which he used to save Pepper Potts during the Malibu Mansion attack and also to face Aldrich Killian in the final fight. It has a dark red and color scheme, just like the normal Iron Man suits, but has more gold than most of the other armors. 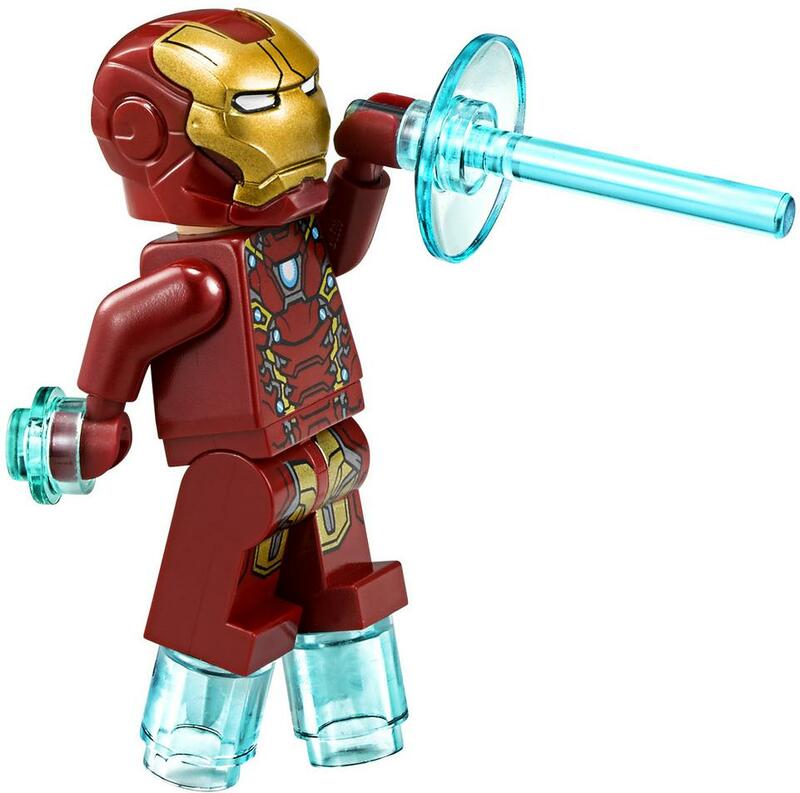 This minifigure came in 76006 Iron Man: Extremis Sea Port Battle with Tony Stark inside, but also appeared in 76007 Iron Man: Malibu Mansion Attack as an empty suit inside a mini LEGO Hall of Armors. 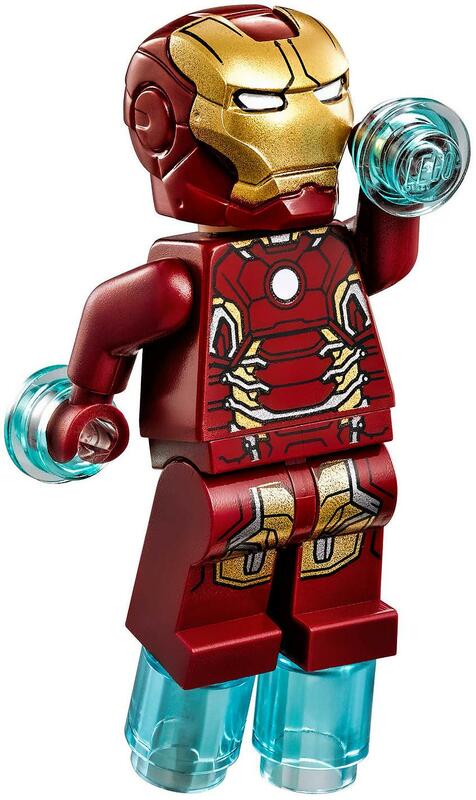 Like most of the other LEGO Iron Man armors, it has translucent blue repulsor blasts from its hands and feet. Up next we have the Mark 43 suit, which was developed and used by Tony Stark in Avengers 2: Age of Ultron. It uses the same helmet mold but with some additional printing on it, while the torso has some pretty awesome printing that shows segmented armor – this is accurate to Tony Stark’s suit in the film. 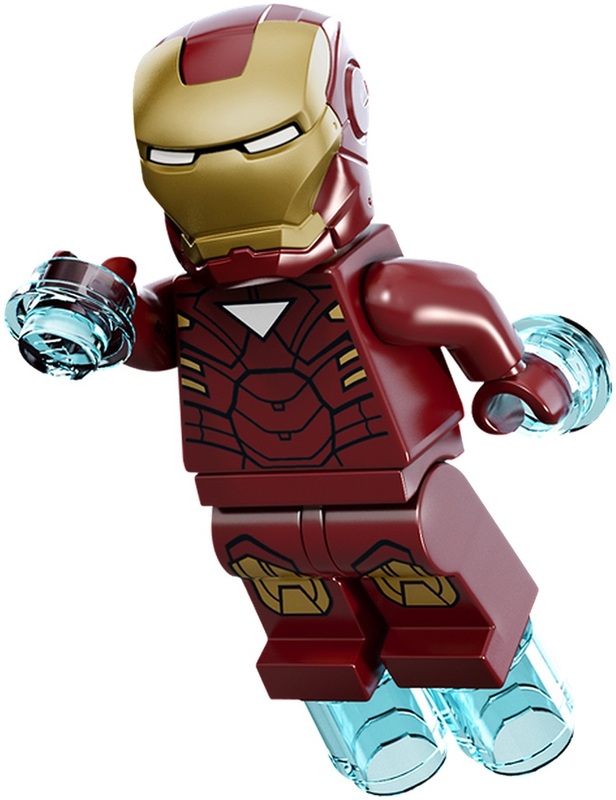 Once again, the figure comes with translucent blue 1×1 round bricks and round plates to represent its repulsor blasts. This minifigure came in 76032 Avengers Quinjet City Chase, 76038 Attack on Avengers Tower, and 76031 The Hulk Buster Smash. 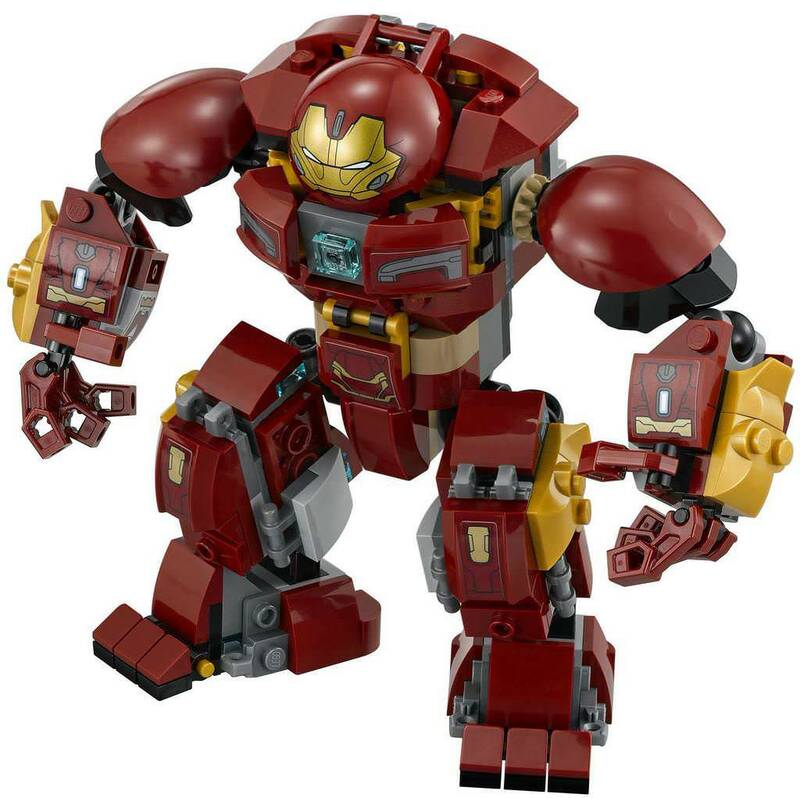 A variant of the MK43 suit was released in 76105 The Hulkbuster: Ultron Edition. It was the same suit, but it had new printing on its torso and legs to show certain segments of armor removed. In the movie, Iron Man does have a couple of small segments of his armor removed to allow his suit to fit inside the famous Hulkbuster. Speaking of the Hulkbuster, here it is! This is the Mark 44 suit, which is a large external armor mech that Iron Man enters. Tony Stark used the suit against the Hulk when Scarlet Witch sent the Hulk on a rampage in Avengers: Age of Ultron. 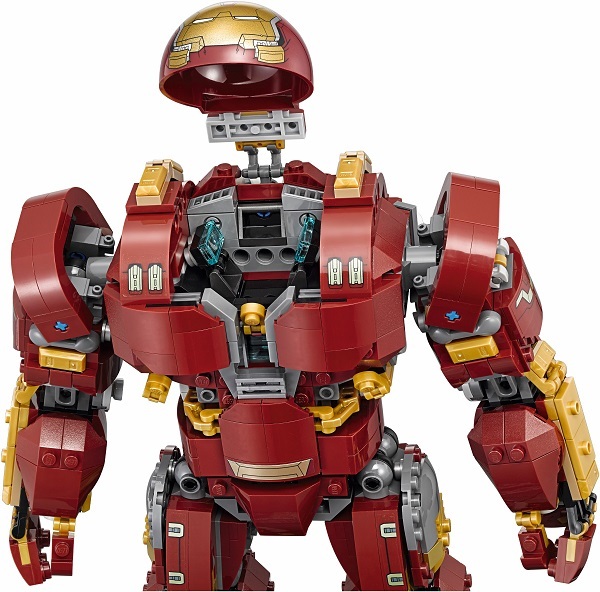 The Hulkbuster suit was represented by a brick-built model in the 2015 set 76031 The Hulk Buster Smash. It also has opening panels and an opening head dome to allow you to place an Iron Man minifigure inside, which is a very cool feature. 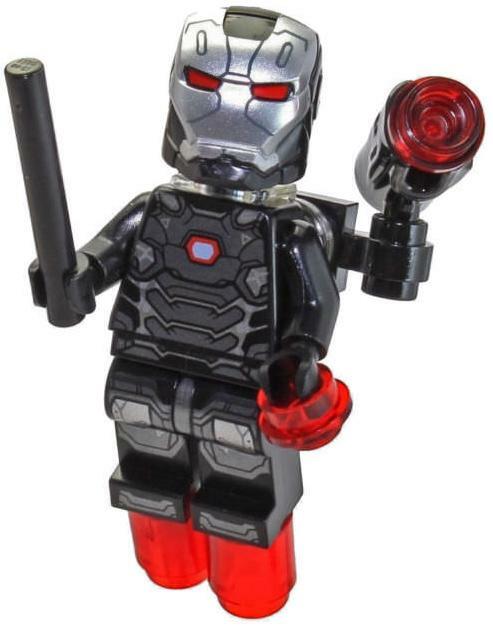 In addition, the arms and legs are poseable thanks to several ball joint connections, while the fingers can grab onto minifigures like Ultron Prime in the image above. The right hand also has a pair of stud shooters that can be fired off at anyone who crosses your path. All in all, this model is pretty awesome and makes for a fun version of a big Iron Man suit. In 2018, a larger version of the Age of Ultron Hulkbuster was released to commemorate 10 years of the Marvel Cinematic Universe. 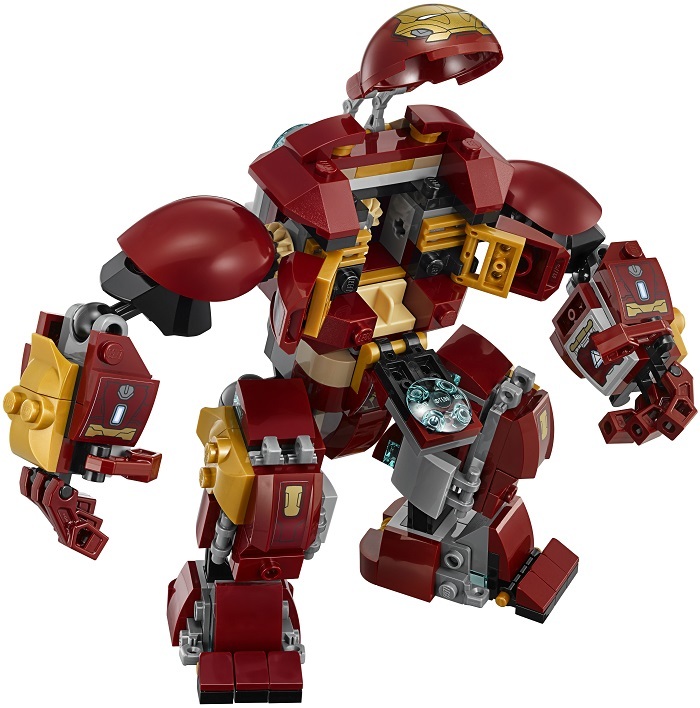 Released in set 76105, it was the second-largest LEGO Marvel set released (at the time of writing), and stood at 25cm tall. … and an interchangeable left arm. 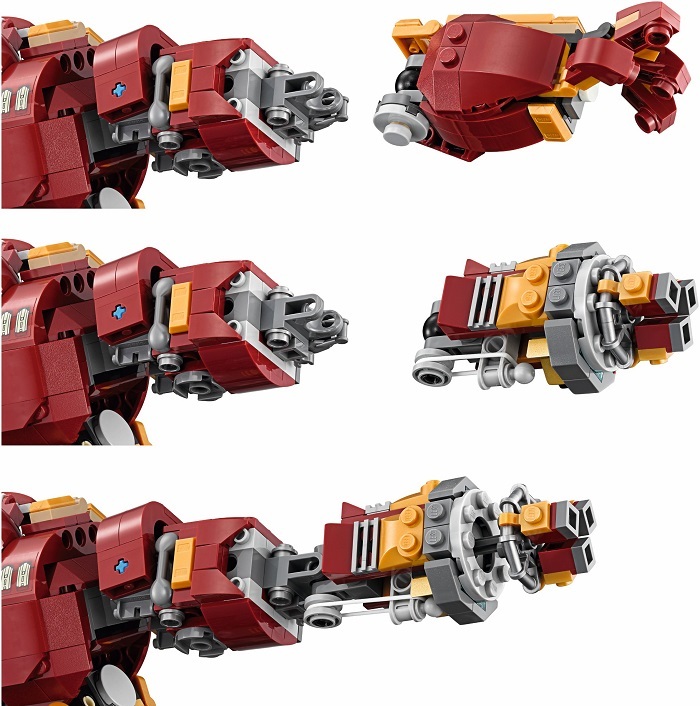 This allowed it to change from a normal left hand into a jackhammer arm, to replicate the scene where Tony Stark uses the Hulkbuster’s secondary jackhammer arm to punch the Hulk’s face. The jackhammer arm even has a rubber band integrated into it! However, the MK43 and the MK44 were not the only Iron Man suits used in Avengers: Age of Ultron. Tony Stark donned the Mark 45 armor for the climactic final battle against Ultron and his minions in the 2015 film. 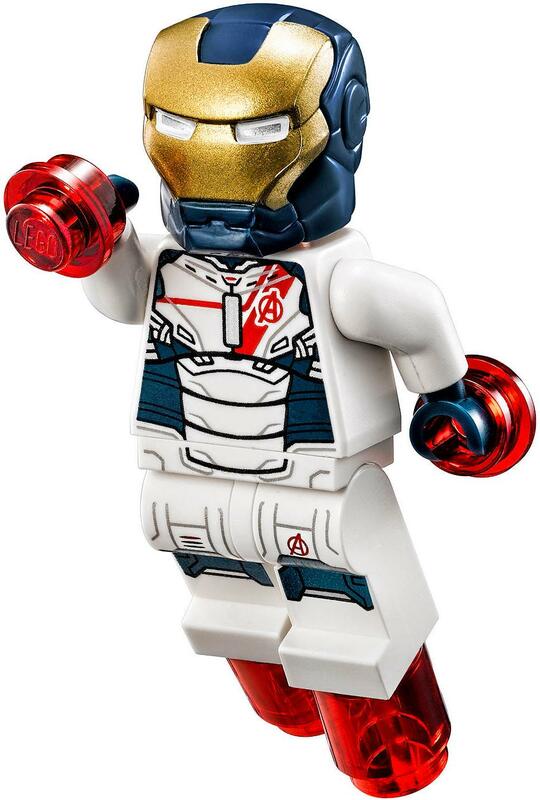 This Mark 45 armor was exclusive to the smallest LEGO Age of Ultron set, 76029 Iron Man vs. Ultron. I think it is also one of the best LEGO Iron Man suits. The printing on the torso and legs is pretty exceptional, with some bright red printing also used to add some contouring – I think this is an awesome technique. The helmet face plate also is different – the eyes are much narrower to give it a more menacing, squinting look; the “cheekbone” areas are also gunmetal grey which gives it a different look. Translucent blue pieces are once again used to form repulsor blasts from the hands and feet. I only wish this minifigure came with some toe printing – it would make it look even more detailed. 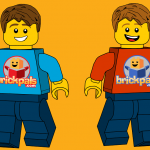 Side leg printing and arm printing would be absolutely sweet but it is pretty unrealistic to expect that for a minifigure in a normal LEGO set. Then for 2016’s film Captain America: Civil War, Tony Stark donned the Iron Man Mark 46 suit, which had experimental nanotechnology that he would later develop further. 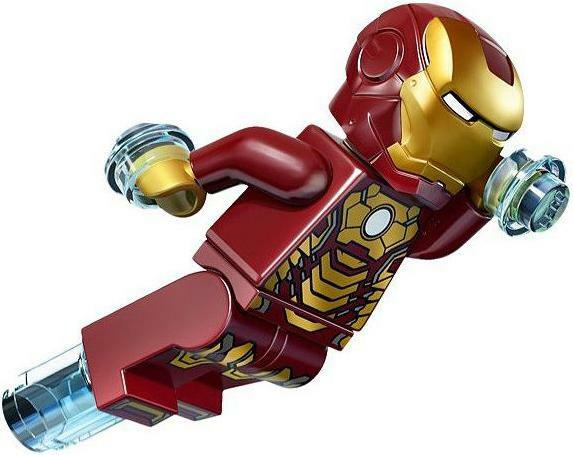 This minifigure depiction of Tony Stark’s suit appeared in 76051 Super Hero Airport Battle, the largest set from the Civil War lineup. It had pretty good printing on the torso and legs, but there was no more bright red contouring which is a little bit disappointing. The face plate of the helmet also looks a bit more normal. 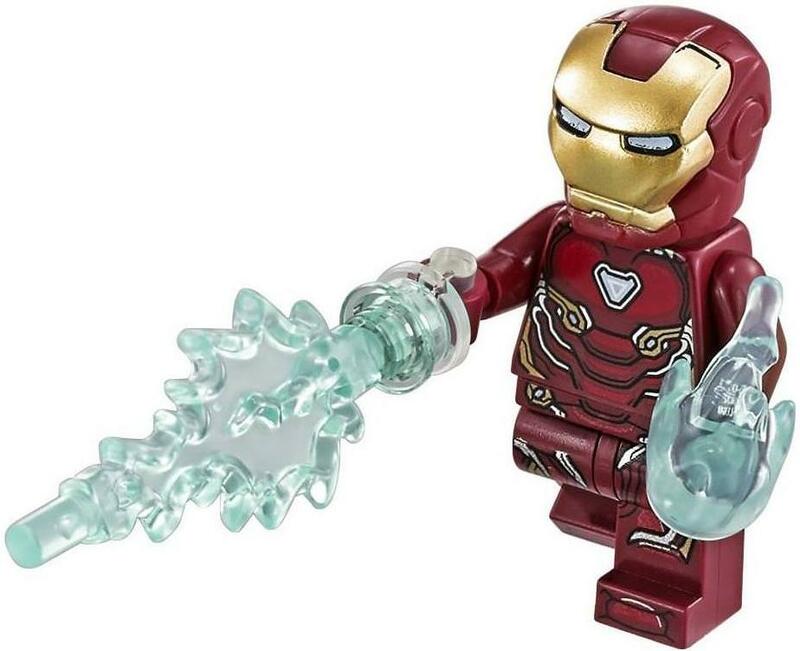 Once again, translucent light blue 1×1 round bricks were used to show the repulsor blasts from the legs, but this time a two-piece build was used to represent a repulsor blast from Iron Man’s hand. It is pretty simple but I think it looks good. Up next is Tony Stark’s armor in 2017’s Spider-Man: Homecoming film. This minifigure was exclusive to 76083 Beware the Vulture, a set that also came with Spidey, the Vulture, and the Shocker. This suit is noteworthy for the fact that it has quite a lot of silver, most notably around the lower torso and upper leg sections. Otherwise, it is pretty similar to the Mark 46. LEGO has accordingly designed the figure to match, and I think it looks pretty good. I just wish that the legs were dual-molded, as the silver looks pretty weird when it doesn’t continue onto the sides. Also, just like in the movie, Tony Stark is not actually inside the suit – it is actually remote controlled! Similar to the suit’s look in the movie, LEGO has included a translucent light blue head to put inside, to show that it is remote controlled, presumably through F.R.I.D.A.Y. or another A.I. 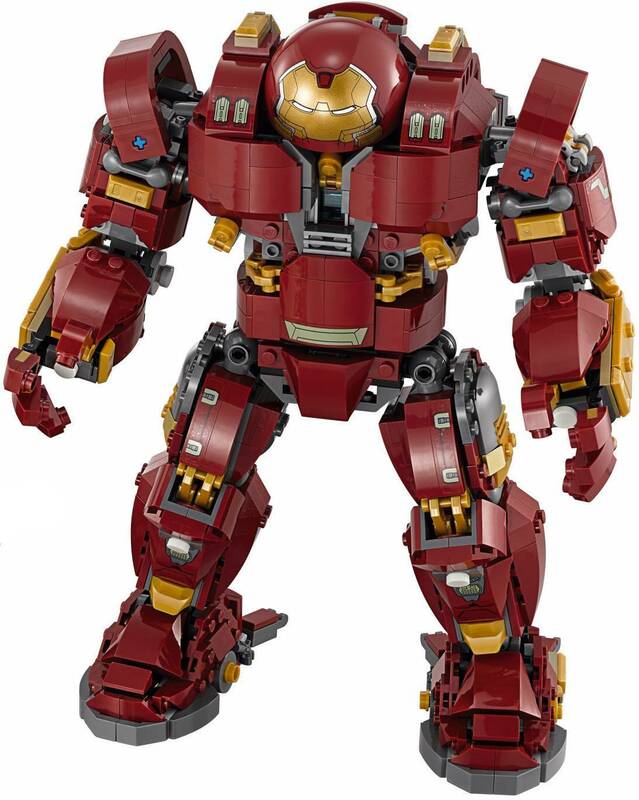 The iconic Hulkbuster suit received an upgrade in 2018’s Avengers: Infinity War film, and that was accordingly reflected in LEGO form. This build came in 76104 The Hulk Buster Smash Up. It had sticker details and a new printed head dome with a more aggressive facial expression. It also had slightly different articulation, with different joints at the waist and even articulated toes! It also had a different way to open the panels to access the interior —— four panels opened in four different directions. Worth noting is the fact that in the movie, the Hulkbuster was piloted by Bruce Banner and not Tony Stark. However, Iron Man’s most advanced suit was yet to come. Avengers: Infinity War debuted arguably his coolest suit yet, the Mark 50 “Bleeding Edge” Suit, fully using Tony Stark’s morphing nanotechnology. This minifigure came in the largest Infinity War set, 76108 The Sanctum Sanctorum Showdown. The face plate had printed light blue eyes, while the torso had a pretty interesting, more organic design. Pleasingly, this minifigure armor brought back the bright red armor contouring. Pretty noteworthy is the fact that this armor got rid of the old translucent light blue bricks for repulsor blasts, replacing them with translucent light blue versions of 2018’s new Power Bursts. This gave a variety of blasts that Iron Man could use in battle. Another variant of the Mark 50 suit appeared in 76107 Thanos Ultimate Battle. It was the same figure, but it had a huge neck attachment to represent the four wings that come out of the armor during the fight on Titan. The wings were mounted on clips and could hinge slightly. They also had stickered 1×4 curved slopes and translucent light blue Power Bursts for additional detail. I get what LEGO was going for here, but I think the neck attachment is far, far too big and it looks very bulky and ugly to me. I wish LEGO would have instead gone with a new one-piece mold that would be more proportional. This armor is the Mark 51, but is better known as the Invincible Iron Man suit. It has not yet appeared in the movies, but is instead from the comic books. This suit was worn by Tony Stark and later Riri Williams. 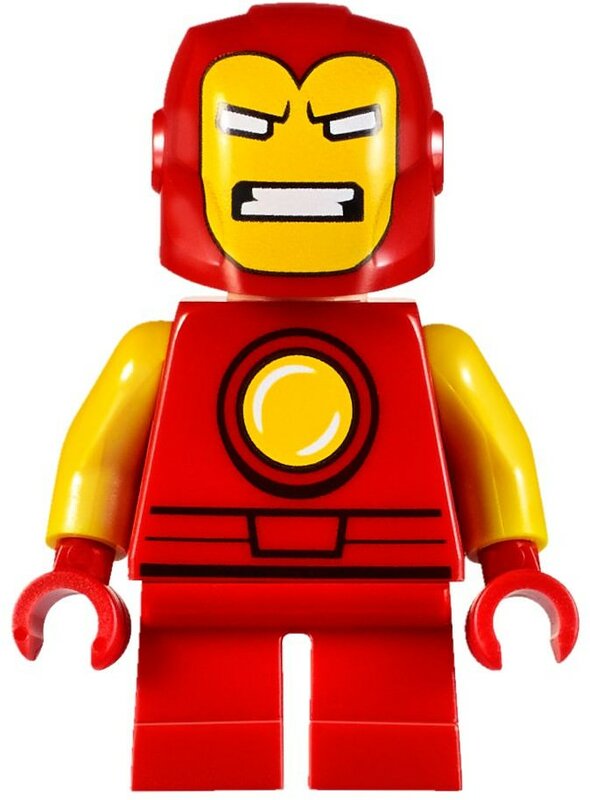 This minifigure was released in 2017, sporting a bright red and golden design that resembles comic books more than the grittier MCU. The most significant change was the new helmet — a brand new mold that did not have an opening face plate. Rather, the face plate was printed onto a flat surface. 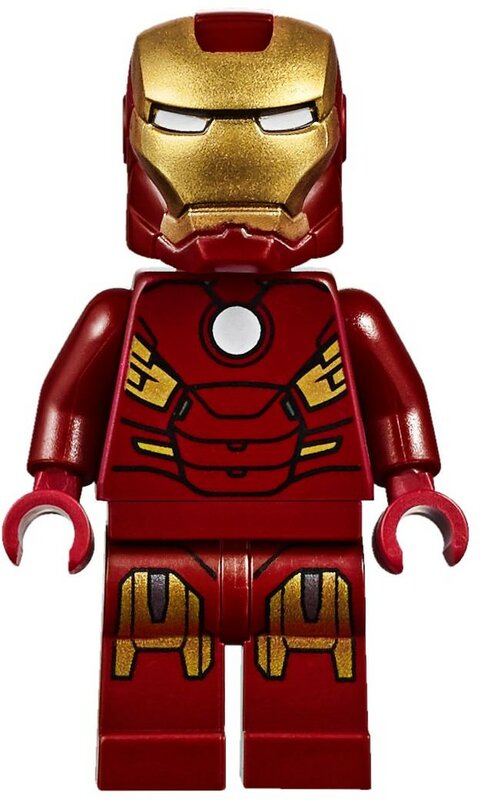 This piece caused quite a stir amongst LEGO fans when it was first revealed but fortunately the original helmet mold was still used for MCU Iron Man minifigures. This new helmet mold would later be used for other minifigures like Super Adaptoid, Vulture, Wasp, and Rinzler (from Tron). The minifigure has decent printing on the body. It has toe printing and a printed hexagonal arc reactor. It also has translucent bricks for repulsors but introduced a new translucent light blue Power Blast, which was a new piece for 2017 that could actually be fired off. 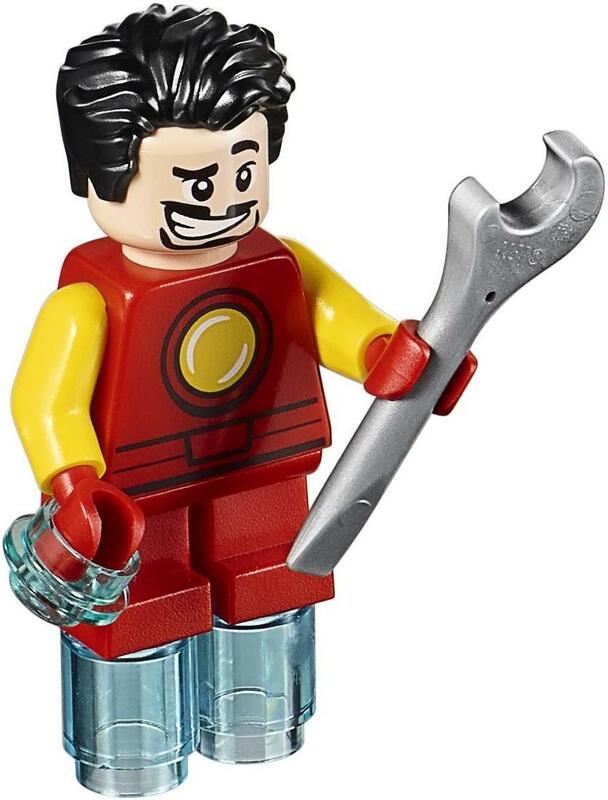 Tony Stark’s classic comic book Iron Man suit was released as a minifigure in 2017, but there was a catch — it was a Mighty Micros figure. Unfortunately, this meant the minifigure had short legs, very simplified details, and a strange helmet that had a mouth with teeth printed onto it. Nevertheless, swap out the short legs for some full-size ones, and you have a decent classic Iron Man suit. 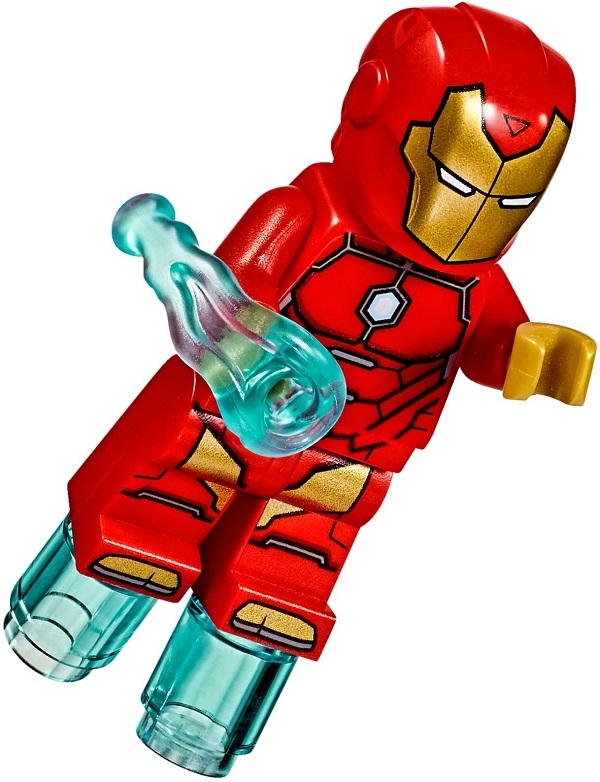 The minifigure came with other accessories: a hairpiece for Tony Stark, a silver spanner, and some translucent light blue bricks for repulsor blasts. While not technically an Iron Man suit, the whole reason why the Iron Man suits were able to be created in the first place is the man, the genius behind them – Tony Stark himself. 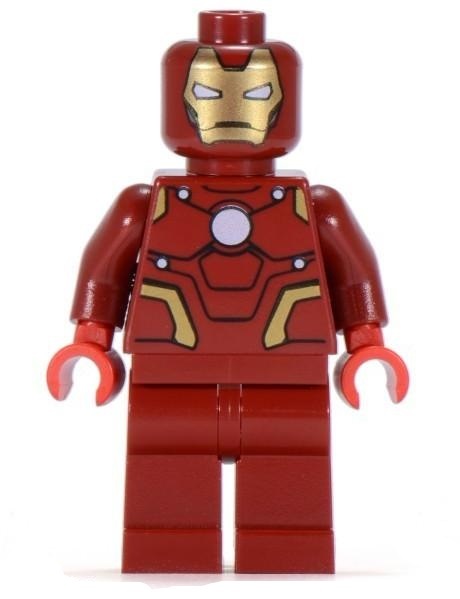 Two versions of Tony Stark have been released in LEGO form, the first of which is this 2013 one based on Iron Man III. He has a tousled brown hairpiece and a confident smile, along with a simple black and grey outfit that shows his arc reactor. Despite being simple, this figure is still pretty close to how Tony looks in the movie. 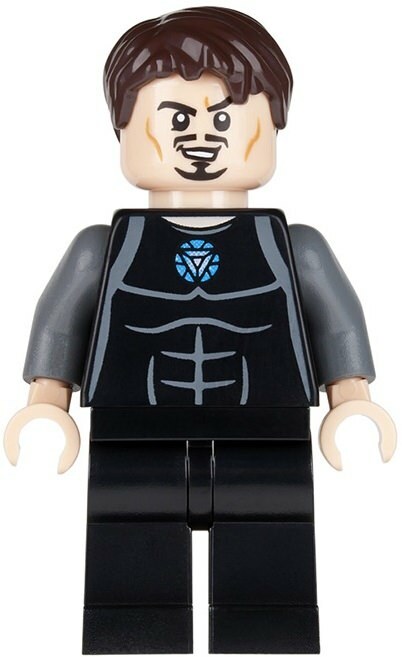 The other Tony Stark minifigure was released in 2018’s Marvel Bricktober pack, and is based on Tony’s look in 2018’s Avengers: Infinity War. He has a spiky black hairpiece and a new double-sided head piece with a smile and scared expression, though disappointingly he does not have his F.R.I.D.A.Y. glasses like in the movie. He wears a dark grey jogger outfit with the triangular Mark 50 storage unit mounted on the outside. The grey outfit is nice, with camouflage printing that continues onto the legs and arms, but I think it looks a little bit light in color and black with grey might be more accurate. While this armor is not piloted by Tony Stark, it is still technically an Iron Man suit. This is War Machine’s Mark 2 Armor, which was used by James “Rhodey” Rhodes in Iron Man III. This figure was exclusive to 76006 Iron Man: Extremis Sea Port Battle. It sports a grey color scheme that reuses the Iron Man helmet mold in grey and some pretty good printing on the torso and legs. The figure had a new double-sided head and had translucent red bricks to represent its repulsor blasts. It also had a shoulder-mounted gun made from two simple pieces. Up next is a re-painted version of the War Machine MKII armor – the Iron Patriot. In Iron Man III, the War Machine armor was repainted into a more American color scheme, and that repainted suit was used for most of the movie. 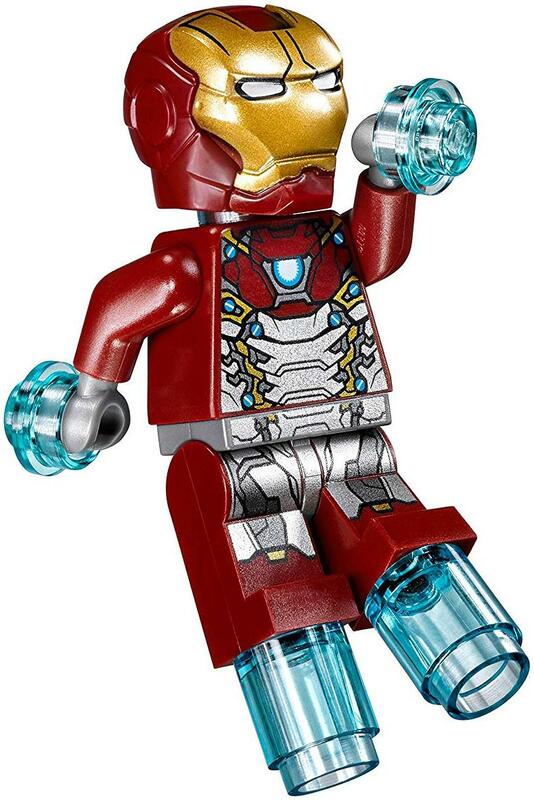 The suit was released as part of a LEGO Iron Man III polybag named “Gun Mounting System”. It had a dark blue color scheme with highlights of dark red and silver, along with a black shoulder-mounted cannon and a yellow platform. 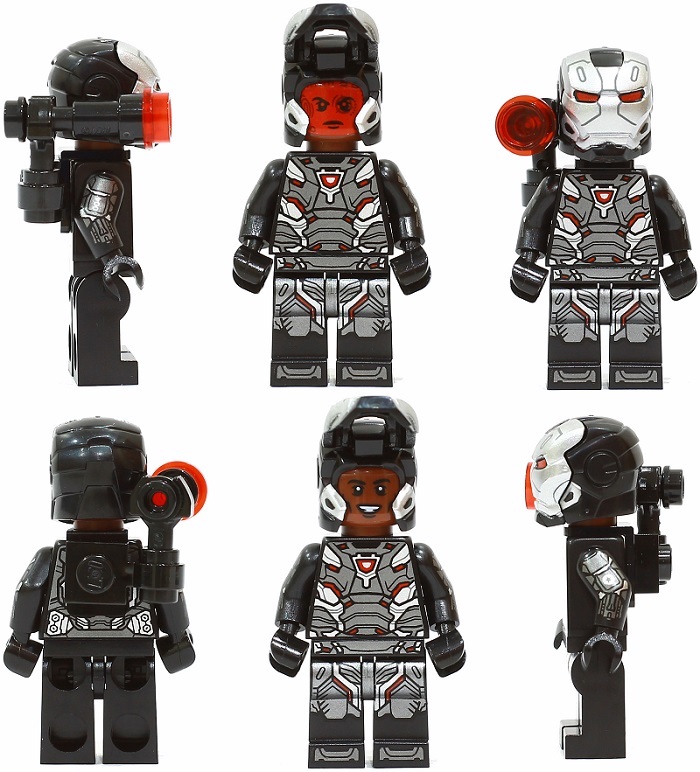 Up next is the Mark III version of the War Machine armor, released in 76051 Super Hero Airport Battle for 2016’s Captain America: Civil War. It had more black in its color scheme (just like the Mark I War Machine) with a silver face plate, along with piercing red eyes. The torso and leg printing was pretty good, and once again translucent red repulsor pieces were used. The shoulder-mounted gun was a black stud shooter and there was also a baton clipped at the back, which was accurate to War Machine’s suit in the film. Up next is the Mark IV version of the War Machine suit, which appeared in Avengers: Infinity War. 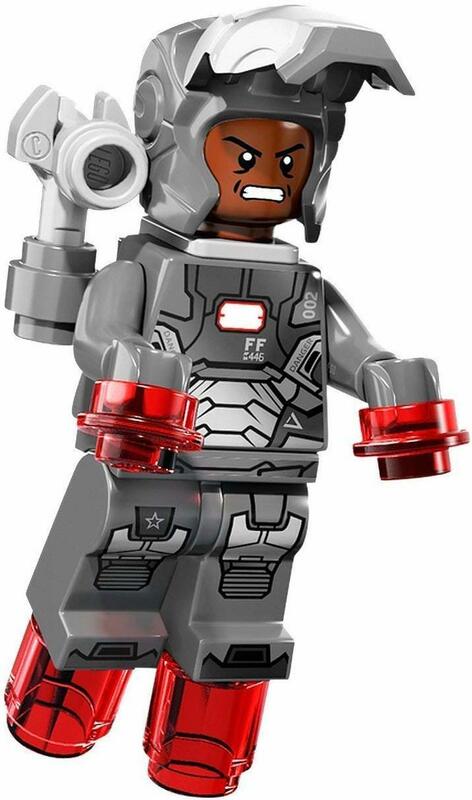 This LEGO Iron Man minifigure was exclusive to the 2018 Marvel Superheroes Bricktober Pack, with a black and grey color scheme and pretty detailed printing. It had new arm, torso, and leg prints, though I believe the face plate was reused from the 2016 one. It had a shoulder-mounted gun that was not a stud shooter, and only came with translucent red repulsor pieces for the hands. The head piece was a new double-sided head that had a smiling expression on one side and a HUD on the other side. Last but not least, we have a member of the Iron Legion – a robotic suit of armor around the world developed by Tony Stark to respond to missions without needing to call the Avengers. These Legionaires appeared in Avengers: Age of Ultron, where they were taken over by Ultron and used against the Avengers. 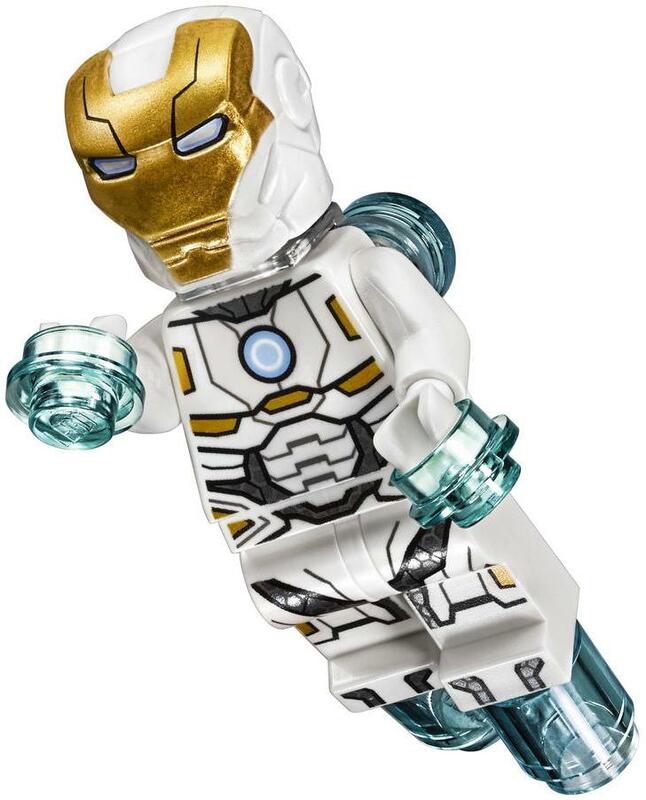 This minifigure itself appears in 76038 Attack on Avengers Tower, and has a unique dark blue, gold, and white color scheme. Its head piece is translucent neon orange in color and it has translucent red bricks to represent its repulsor blasts. Two of them were included in the set but I’m sure you could buy more online to build your own LEGO Iron Legion. Let me know your thoughts as a whole, and also comment which suit is your favorite! My favorites are the Silver Centurion, War Machine Mark IV, and the Iron Man Mark 45. Let me know which ones are yours! Thanks for reading! 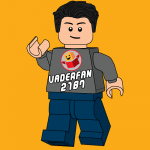 I’m VaderFan2187, and I’ll see you next time on BrickPals.com! Did you know that you can easily make your own real-life full size Iron Man Suit and Armor? We’ve found an amazing exclusive members area which details exactly how you can build one. 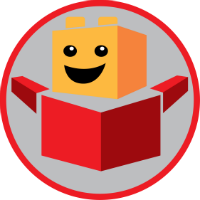 They give you easy-to-follow guides, video tutorials, a full materials list and guess what…. You get handed the professional 3D designs made into printable pages, which can all be printed from a home printer! We’ve managed to secure an EXTRA 10% OFF for you! Just enter code NINJABRICK at the checkout. 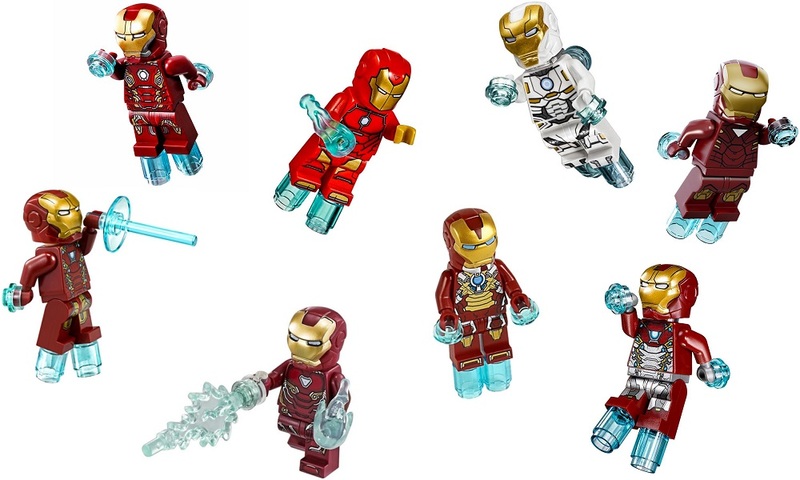 Check out all the LEGO Iron Man Suits, Armors and minifigures from sets, polybags and other means! Including the Mark 4, 6, 42, 45, 47 and War Machine!